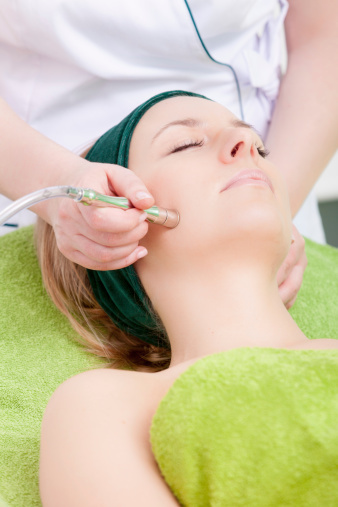 What is Microdermabrasion & Dermaplaning and what is it used for? Microdermabrasion is a skin-revitalizing treatment that helps repair skin that is damaged from the sun, scars, acne, and the unwanted effects of aging. Microdermabrasion is a procedure that uses a diamond crystal tip wand or fine crystals combined with a controlled vacuum to exfoliate the skin. After the treatment, the skin has improved texture and softness, as well as fewer imperfections such as wrinkles and acne scars. Dermaplaning helps to “refinish” the skin’s top layers through a method of controlled surgical scraping. The treatment removes the dead cellular layer on the skin, resulting in a smoother, brighter appearance. There are a number of different levels of treatments that last anywhere from thirty to sixty minutes. Your Aesthetician can recommend a customized treatment for your skin. Is Microdermabrasion & Dermaplaning painful? Not at all – this is a quick, painless treatment. Avoid Retin-A®, sun tanning or tanning creams for at least a week before treatment. Do not have other facial procedures, such as chemical peels, before treatment. One of the advantages is that there is no downtime. You can return to your normal routine and apply cosmetics directly after treatment. We offer over six different types of microdermabrasion & dermaplaning procedures. Aestheticians at The M Spa will select a treatment that is right for your individual needs.